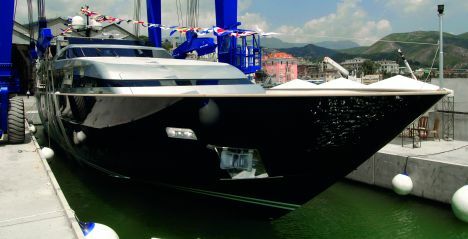 I met Captain Charles Manfredi at the "Varazze yard" right after the new 34 metre Baglietto - he had just taken the command of it at the time - was launched. Where were you born and how did you begin working by yachts? Well, I was born in Colchester, UK, but, when I was two years old, my family moved to Sidney, Australia. When I was 10 years old my father bought me the first sailboat (a seven metre Hood), on which we sailed every weekend in all weathers. I had my first racer, 24 feet in length, aged 12 and an offshore/inshore East Coast 31, 10 metres in length, aged 14; I raced as skipper on it for the Greenwich Club Flying Squadron. My family operated in Sidney in the shipping industry importing semi - rigid dinghies at the time, so since then I have been involving in the yachting world as either a passion or a job. I left for sailing for six months around Asia and Africa aged 20. Then I settled in Great Britain where I began working with my girl friend on building tenders. When did you seriously think about becoming a yacht master? Well, when I was about 30 years old, it was a great recession and I thought looking for a job in the yachting world. So I went to nautical school for three month and aced out the Master Class 5 exam according to the Australian Rules. It's worth remembering that, before entering whichever nautical school, a long navigation experience as well as excellent references from masters of yachts, on which the training was carried out, is required. How useful has been your sailing experience to become shipmaster? Well, sailing is very popular in Australia, so I have skippered 13 - 20 metre yachts for a long time. This training under sail has allowed me to gain a great nautical experience far and wide. Shipmasters are mainly to be found among sailors today. Why have you remain in Europe? Indeed, in Australia one can't make a lot of money since owners think they offer the best job. In Europe it gets even better. This is the reason why I decided to leave Australia. Have you already made long cruising on board superyachts? Of course. On board "Independence", American ownership, we cruised from Europe to the Caribbean Isles and then till the Pacific Ocean; we also sailed from here to New Zealand to watch the America's Cup. In 2000 I crossed the Atlantic on board "Atmospher" owned by a Frenchman. How did you become the Master of this Baglietto? Well, on my "fortieth" birthday last year, I decided to have a working pause, I got married and after the honey - moon I went to Great Britain with my wife, where we have supervised all works at our new cottage near Portsmouth: We also have done it for our son Luca. Having closed this important life parenthesis I have begun navigating in summer for remaining with the family in winter and working at the maintenance of the yacht. I have found my last engage by passing the word on, the easiest way for communicating in the yachting world. What kind of cruising will you be making? Well, the owner wants to make many but short cruises, at most a week long. He'll be arriving at the established departing harbour to make coastal cruises and stop in the most prestigious places. At the end he'll be leaving and we'll be often calling each other and deciding the next harbour. Would you tell us something about your worst experience at sea? Well, I remember a terrifying one. I was crossing the leg between Australia and Tasmania, called "Bass Strait", on board an only 13 metre boat when I ran into a hurricane, the absolutely worst one in my career; it means 100 knots wind, 50 metre high waves and the anemometer needle fixed on 60 knots during the entire trip. It was very hard to survive; I can say both boat and crew were pretty good, indeed. Pure Australian sailor race! And the most beautiful memoir of? Well, I certainly remember a cruise in the Pacific, diving wonderfully. What about the role of shipmasters and the yachting world, in which you usually operate? Indeed, the yachting world gives the benefit of visiting the most beautiful places in the world. Sometimes owners can't do that because they usually have no time for. Of course, in the peak season one's under stress, it means one works sixteen hours a day without a break for seven days a week aside from being responsible of the safety of yacht, crew and guests, to mention three of the most important things on board, and the great living organization that must go without any stumbling block. I supervised all works at this new Baglietto under construction and I should press as owner's representative the shipyard to end each working stage on time till up the delivery and control the quality of the work with great attention to detail, as well. Previous lead experiences: 20 years - running career: sailing yacht "Adele" 52 metres in length (First Officer), "Independence", a 53 metre Perini (lead), a 52 metre M/Y by Amel yard (lead). Main yacht's features (project, materials, accomodation): Aluminium custom pleasure Motor Yacht, 52 metres in length, max speed: 32 knots; five cabins for twelve guests. Project: Baglietto in - house project studio. What kind of yachting innovations does impress you greatly and why? Doubtless the "Broadband", namely internet via Sat right in the ocean.